Creative and fresh ideas for wineries with restaurants excite me. 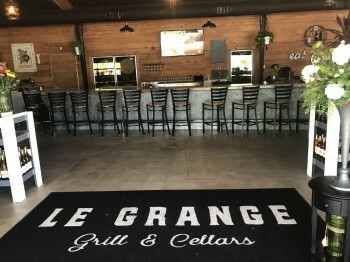 Le Grange Grill and Cellars is a nod to the French word “grange” that means “the barn,” a perfect name for this sleek new restaurant and winery with the traditional barn red and white exterior in Old Town Murrieta, California. Walking through the doors of Le Grange, the first thing you notice is the contemporary bar where you can sip wine or beer if you just want to enjoy a relaxing time. Once you glance to the right of the bar, you realize just how much wine this winery has. There are rows and rows of beautifully labeled wines. 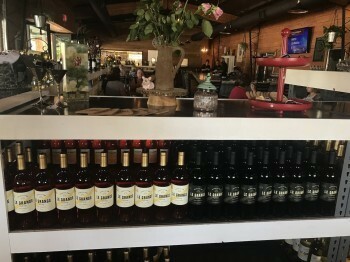 These wines are produced from grapes that come from both the Temecula Valley and from the Lodi area that specializes in delicious Chardonnays, Cabernet Sauvignons, Merlots and Zinfandels. 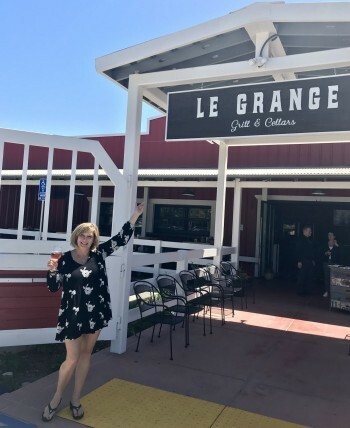 Debbie and Doug Wiens, owners of Le Grange, bring expertise from their winery in Orange County, CA, called Orange Coast Winery, voted best winery in Orange County in 2017, as well as the Wiens Family Cellars in Temecula. You might say wine is in the family blood. From following the efforts of these two on Facebook, I became very aware of the challenges they faced in opening a new restaurant and winery. I was lucky enough to meet Debbie Wiens at Le Grange to see how everything had come together. Debbie’s warm Midwestern personality let’s you know right away why people enjoy the properties these two have created. Doug had always wanted to be a vintner and has a degree in Horticulture as well as a graduate degree in Food Science. (Not only is Doug an accomplished vintner, but he built all the wood tables and wine racks in the restaurant.) Debbie’s degrees are in Theater Arts, Education, and Educational Counseling. Together they bring the perfect blend of talent for their successful wineries and now their new restaurant. Doug’s son, Joe, the principle winemaker at Wiens, who had worked for two restaurants in Sacramento, helped at Le Grange by setting up the training and service policies and procedures. Debbie was quick to point out that as much as possible Le Grange’s cuisine is fresh, locally sourced, and made from scratch. 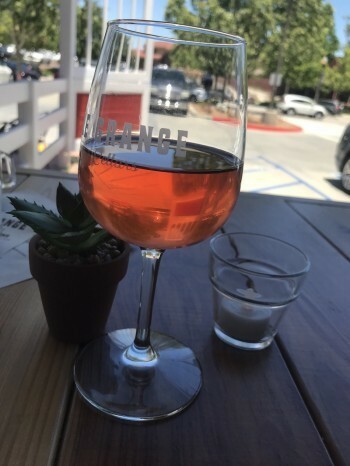 After sampling the lovely Rosé, with summery tastes of watermelon and strawberry, at the far end of the building which is the winery section, we were off to the spacious outdoor patio for lunch. This restaurant is unique because of the abundance of outdoor seating. One of my favorite seating groups is the outdoor grouping of bar stools facing a set of bar stools inside where conversation can be carried on when the window separating outside and inside is open. This area then becomes a table where a large group can eat and visit. Debbie, who is a very creative person and a self-described “foodie,” designed the initial menu. As a fellow Nebraskan, I could not wait to try the Bierocks, a salute to our native state’s famous dish called Runza. 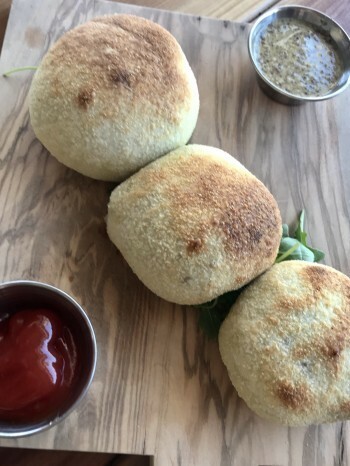 These individual small buns are filled with hamburger and cabbage and served with a beer mustard dipping sauce. (If you want to be authentic, ask for a side of ketchup for dipping.) Debbie told me that Doug loves “all things” burger and all kinds of pizza so she made sure these favorites are on the menu. We also tried one of my favorites, the Maple Bacon Wrapped Dates, stuffed with mascarpone cheese and pistachio and cooked to perfection with the crispy, crunchy outside of bacon and the gooey date inside. Of course, desserts always need sampling. 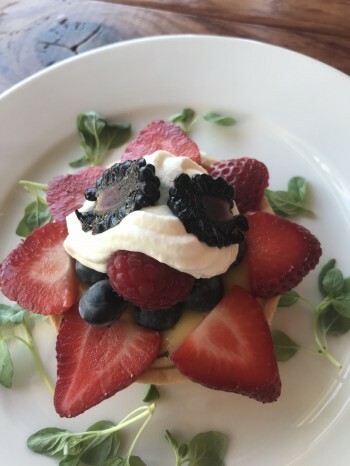 We indulged in the fruit tart, a tart topped with berries and a lusciously creamy filling in the tart. To accompany this tart, we drank a glass of the Chateau Picque Bordeaux from France. Having a wine list with wines from around the world adds to the fun of having lunch or dinner at Le Grange, a unique approach by winery owners. And it is wonderful that by being a member of Le Grange's Wine Club, you receive discounts on wine and food in the restaurant. 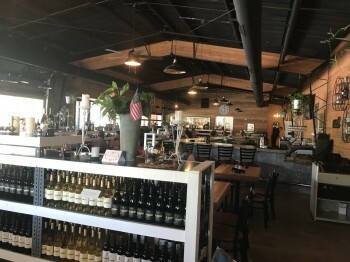 Le Grange Grill and Cellars brings a new vibe to the Old Town Murrieta area and will certainly be a hit for years to come. You can find Le Grange at 24683 Washington Avenue, Murrieta, CA 92562. Give them a call for reservations: 951-600-2800. As is customary in this industry, I was treated to this superb venue. However, my love of Le Grange Grill and Cellars should be clear to the reader.